A FUNDRAISING campaign has been launched to help pay for a greyhound’s pricey vet bills. Nine-year-old ex racer Alfie is suffering from a mystery spinal injury. 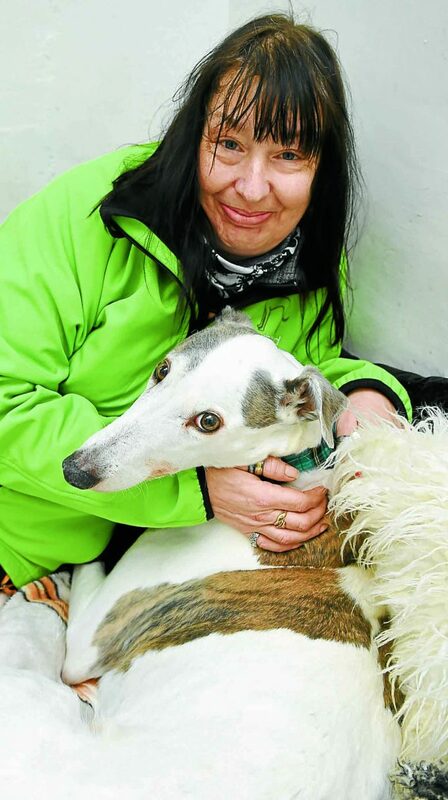 The pooch currently lives with Mandy Bleasdale, owner of Happy Houndz Kennels in Lockerbie and a huge lover of greyhounds, pictured left. Their home is also one of 52 UK branches of the Greyhound Trust, who collectively rehome 4000 retired racing greyhounds a year. A few months ago Alfie badly damaged his back, while he was living with a different family. His owners at the time found him too dif cult to care for as a result and they returned him to the Lockerbie branch of the trust and into the care of Mandy. He has been seen by a specialist vet but they cannot treat him until they know for sure what his injury is, and this will require a costly MRI scan with a pricetag of around £2000. To help fund the scan, Mandy has created an online GoFundMe page. She said: “Alfie is a lovely lad, he’s cheeky and playful but unfortunately he can’t play very much just now, he just falls over. “He needs an MRI scan to establish what’s wrong and if it’s operable it would likely cost a further £4000 for surgery.